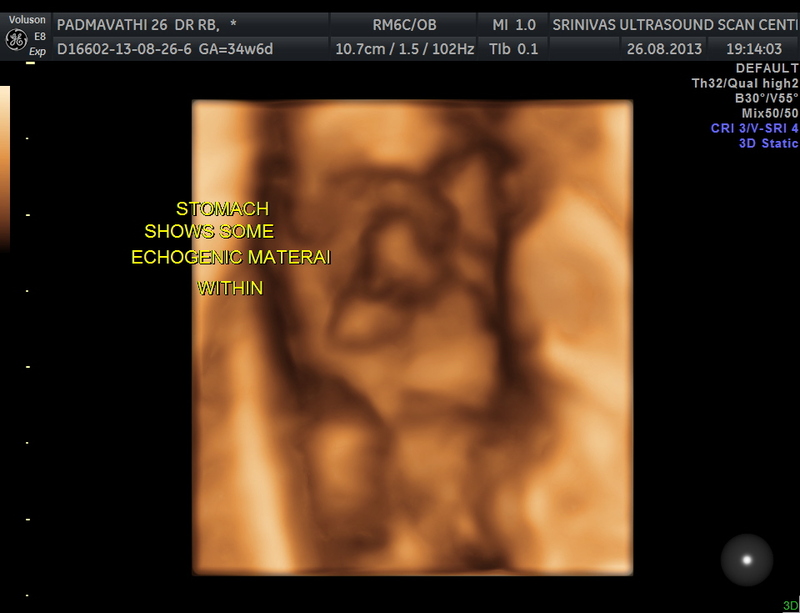 This was a 26 year old lady with history of 35 weeks gestation referred for a routine scan . She had undergone scans elsewhere earlier for the current pregnancy. She was a primi with no history of consanguinity and she was asymptomatic. Her scan was normal , except for the following findings. 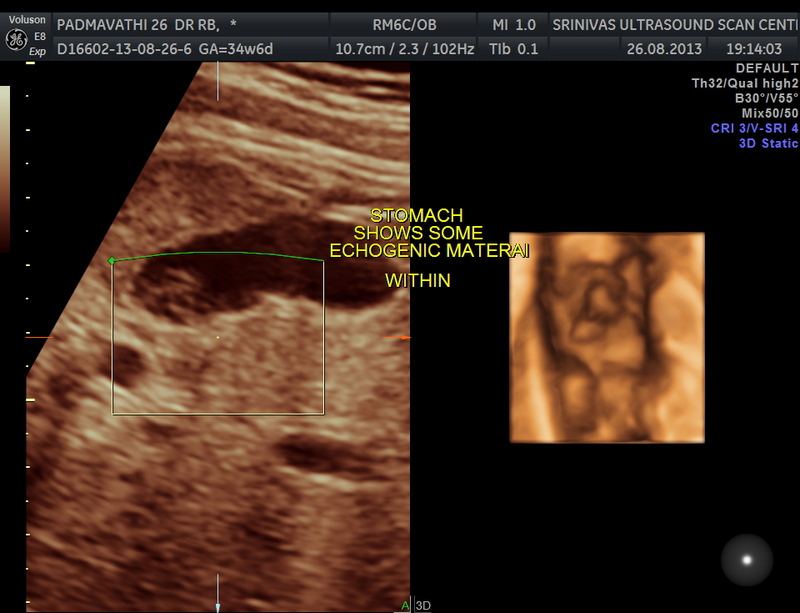 Echogenic material is seen within the stomach. The following are 3 d images , which prove that this was not an artefact. The placenta was posteriorly placed and appeared normal . The amniotic fluid showed vernix caseosa. 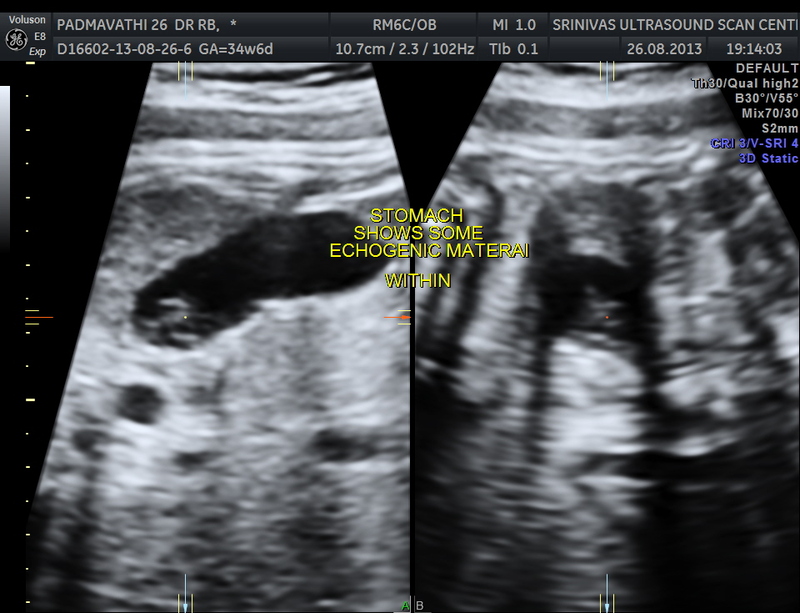 At US examination from the second trimester onward, the fetal stomach appears as a uniformly anechoic, sharply circumscribed round structure in the left upper quadrant. However, debris is commonly visualized in the stomach, forming a pseudomass. The origin of echogenic masses within the gastric lumen is incompletely understood. As they are seen in multiple planes, technical issues are unlikely. They may be due to swallowed cells that aggregate because of the relatively poor peristaltic activity in the stomach early in the second trimester . When intraamniotic bleeding has occurred, these pseudomasses are commonly visualized. They inevitably disappear during follow-up examinations and are not associated with an adverse neonatal outcome. Therefore, further evaluation of this finding is not required.